It was fish that brought Europeans to Newfoundland, it was fish that dictated the pattern of their settlement, and it was the catching, salting, drying and marketing of fish that laid down the forms and structures of the society they built. For two hundred years the fishery was carried on mainly as a seasonal enterprise from ports on the other side of the Atlantic, but as conditions of market and competition changed, it became advantageous for Great Britain to have a fishery based in Newfoundland. By the middle of the 19th century, Newfoundland had a resident population of over 100,000, and an apparently secure position as the world's largest exporter of salt codfish. The earlier migratory fishery was carried on by fish-trading companies, mostly based in southwestern England, that brought out employees and indentured labourers. 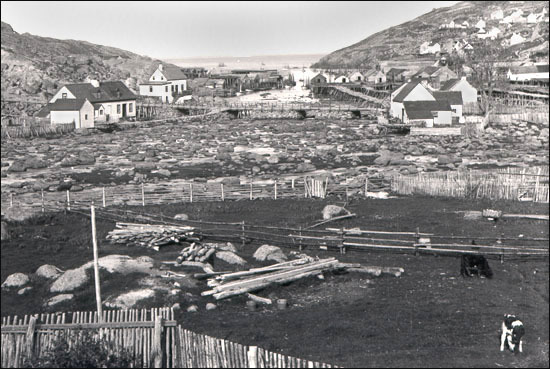 The Newfoundland-based fishery of the nineteenth and first half of the twentieth centuries was carried on mainly by fishers who were nominally independent, but were tied to merchant companies that outfitted them on credit with gear and supplies and took their fish as payment. Most fishers sailed or rowed in small open boats from their home communities to nearby fishing grounds, and brought back their catch to be processed -- split, salted, and tended while drying -- by the whole family. These efforts paid for basic gear and supplies, and in good times occasional rare luxuries, but fishing families supplied a major part of their living by a ceaseless round of activity, growing vegetables, cutting wood for fuel and lumber, building houses and boats, killing seals, keeping poultry and other livestock, hunting and trapping. Fishing families supplied a major part of their living by a ceaseless round of activity including keeping livestock. Photo by Holloway. Courtesy of the Centre for Newfoundland Studies (Coll - 137, 7.04.004), Memorial University of Newfoundland, St. John's, NL. Two other branches of the fishery required a somewhat higher level of capital investment. From centres mainly, though not exclusively, along the northeast coast, vessel owners would carry fishing crews "down north" to Labrador for the summer, where they fished as "floaters" (from the vessels themselves), or as "stationers" (living in camps ashore for the season and fishing from small boats). From other centres, mainly, though again not exclusively, on the south coast, operators of "banking" vessels would carry men and dories a hundred and more miles offshore to the cod-rich Grand Banks, where the men would row out in the small boasts from the mother vessel to catch cod on hook and line. Almost everywhere, the fishery was a seasonal occupation, and although in time other species came to have commercial value, the focus of the effort was cod. Both facts have left their marks in the language. Even now, when an older fisherman speaks of “the voyage”, he does not mean a particular trip to the fishing grounds, but rather the whole season's fishing. And when rural Newfoundlanders say “fish”, they mean cod: other species are called by name. At the peak of this traditional fishery, in the 1880s, two hundred thousand people were spread along 6,000 miles of rugged coastline, mostly in small outport settlements. Ninety per cent of the male work force was engaged in fishery-related work, and 90 per cent of the colony's exports were of fishery products, mainly salt cod. The introduction of the cod trap at Bonne Esperance by William Whiteley, and the first appearance of steam-powered ships, both of which occurred in the 1860s, had powerful effects. Many of the fishermen took part in the annual seal hunt as well. But the fishery could not continue to expand, and during the 20th century successive governments pursued economic diversification, some would say to the detriment, or at least to the neglect, of fishing. By 1940, fishery products made up only 24 per cent of exports. The industry continued, however, to employ a large portion of the work force, and in many outport communities remained almost the only source of employment. After Newfoundland became part of Canada in 1949, salt fish markets declined, while markets for frozen fish products increased. In the past, Newfoundland salt fish was traded widely to a number of countries; the frozen fish trade was almost entirely with the United States. As late as 1969, analysts still referred to Newfoundland as a “dual economy.” On one side was a small "modern" sector which consisted of construction and resource extraction industries, like the mines at Buchans or St. Lawrence, or the pulp and paper plants in Corner Brook and Grand Falls. On the other side was the large and depressed “traditional” sector of the inshore fishery, which for many fishermen included going “to the ice” for the spring seal hunt, or cutting pulp-wood in the winter. But some aspects of the fishery already belonged to the "modern" sector, and change was occurring rapidly. The freezing plants were modern industrial enterprises, and some of the companies that owned them also operated trawlers (also called draggers) that scooped up huge catches of fish using heavy machinery. The development of a union among fishery workers in the early 1970s did much to improve earnings and conditions, but the industrialized fishery put immense pressure on fish stocks. Industrialization was even further advanced in Europe, and vessels from other countries were taking the major share of fish from the Grand Banks. By the time Canada declared a 200-mile management zone in 1977, the main damage had been done. However, as efforts at other kinds of industrial development met with failure or disappointing results, the provincial government encouraged expansion in both the catching and processing sides of the fishery. As recently as 1985, the provincial Department of Fisheries issued a full-colour brochure outlining a plan for fisheries development. Entitled "Fish is the Future", it predicted that landings and prices would increase, and that steady employment would be provided for "at least 30,000 fishermen and plant workers." Stocks continued to decline, and in 1992 a moratorium was declared on Canada's east coast cod fishery. Surprisingly, perhaps, the value of fishery products landed in Newfoundland has remained about the same as before the moratorium. This is because of the increased catch of species other than cod, notably crab and shrimp. The earnings, however, are shared among a much smaller number of people. The end of the cod fishery has meant that many communities have been left without an economic base. Federally-funded programmes providing income support and re-training have allowed many rural people to stay in their home communities, and encouraged them to believe that the cod fishery would come back, but in the summer of 1998 the final version was announced. Fishing licences and fish plants are to be drastically reduced in number, and inducements are offered to fishery workers to retire or relocate to larger centres. Hundreds of outport communities face a very bleak future indeed.